Fans have been worried about Zayn Malik and Perrie Edwards. The singer recently left One Direction due to “stress” after he was spotted holding hands with a mystery blonde who was not his fiancée. Over the weekend, a Swedish woman claimed that she slept with Zayn in Thailand. 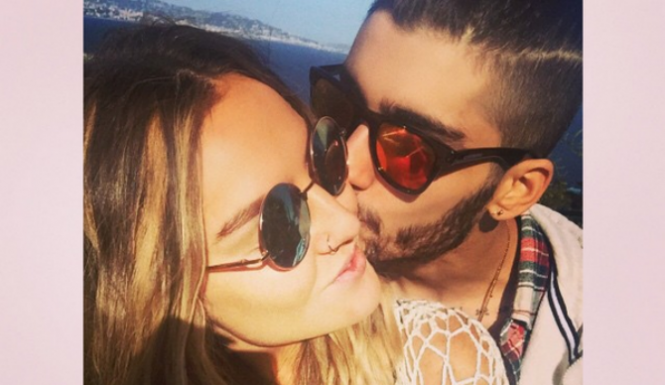 Now Zayn and Perrie have taken to Instagram to let fans know that their relationship is still solid. MTV News reported that Malik flew back home to his shared house with Edwards after he dropped out of 1D’s world tour. Then paparazzi spotted the Little Mix singer leaving his home with an overnight bag. The photos made fans wonder about Zerrie’s relationship status. Perrie shared a photo of Zayn kissing her on the cheek on Instagram. The two are reportedly vacationing in Perugia, according to the MTV News report. Zayn’s sister, Waliyah, also shared some photos from the couple’s romantic vacation. She shared a photo of Zayn and Perrie posing in front of a gorgeous view of the capital city of Umbria. Now the media believes that Malik and Edwards appear to be on good terms. Several news sites noted that the two look to be very much in love. This also caused rumors to swirl that Malik and Edwards are getting married as soon as possible. Hollywood Life believes that the troubled couple is having their honeymoon before their wedding so they can celebrate their relationship. The celebrity gossip site also revealed that Perrie has put Zayn in the dog house after rumors surfaced that he was cheating on her in Thailand. Zayn proved to his fiancée that he’s a changed a man by saying he wants to “get married sooner rather than later.” Hollywood Life hinted that a Zerrie wedding could be happening very soon. Even Malik’s relatives are hinting about a wedding. His sister and cousin took to social media to boast about the supposed happy couple. Malik’s cousin, Daniaal, hinted that something big is happening sometime soon and that it “starts with m and ends with an e.” That made 1D fans wonder if Malik and Edwards are really tying the knot after all. They’re not only planning to tie the knot soon; Malik and Edwards are also on the market to buy a new home. The two were reportedly looking at a home in Hertfordshire. Paparazzi got several photos of Malik and Edwards on their house-hunting journey throughout much of last week. Another news was reported in local Pakistani media that after leaving 1D Zayn is seen in Pakistan but no confirmation came yet. The leaving of the band made a serious damage to Zayn’s fame but this news has appeared as a knot to keep his fans tied to him.